Ranch is located only 50 miles from Houston and is located just south of West Columbia. 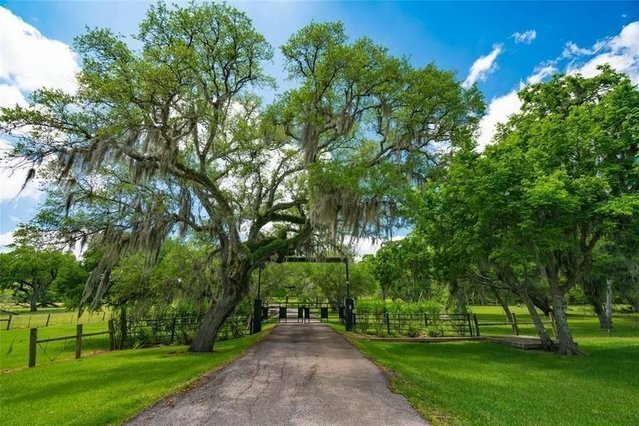 This is a live river ranch with a fantastic home surrounded by huge live oaks, pecans, rolling pastures and 1,500' of the San Bernard River.The house is a 6,200 square foot home and includes two master bedrooms on each wing of the house with large living room, dining room, kitchen, den and a guest bedroom between the two masters. The second floor is a 1,600 square foot room with full bath and currently used as a bunk room but could easily be converted into a guest suite, game room or exercise room.Outdoor areas include a 25-meter lighted, heated swimming pool with fountains, walkways and sitting areas to enjoy a campfire or just relax and enjoy the views. At the river you will find a large boat dock to provide access to the river for entertaining, water skiing and fishing. Wildlife is abundant with deer, wild hogs, Sandhill Cranes, and Dove just to mention a few.